Wrexham residents are facing a 5.5% increase in their council tax bill from April after the council backed budget plans for the coming year. Council leader Mark Pritchard said it was facing "extremely difficult times". The ruling independent/Conservative coalition has said it needs to make cuts of £18m in the next two years. Libraries could close or move into other buildings, but plans to cut free transport for pupils attending faith schools were dropped. The budget agreed by the full council on Wednesday means the annual bill for Band D properties will rise by almost £60 to approximately £1,150. The authority will see its Welsh Government grant - which makes up about three-quarters of its £237m budget - cut by 0.1%. Councillor Pritchard said Wrexham had lost £62m in government funding since 2008, according to the Local Democracy Reporting Service. But he added: 'We have listened to the public on council tax and kept the increase as low as possible. "We didn't want to [do this] but this is what we have to do in these extremely difficult times." Councillor Pritchard said Wrexham's council tax rise compared positively to others. 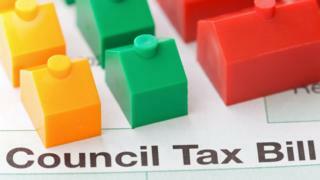 Neighbouring Flintshire set a council tax rise of 8.75% yesterday. Wrexham councillors backed the budget by 44 votes to two, with two abstentions. Last October, the council backed a plan to close a number of businesses it ran to provide work opportunities for people with disabilities.